Harry Harmes, franchise owner of ServiceMaster of the Valley in Kentville, Nova Scotia, began looking into telematics software after one of his trucks was stolen with no way of tracing it. Though the vehicle was eventually recovered, it was damaged and there were no security measures in place to keep this from happening again. That’s when Harmes turned to Geotab fleet tracking, provided by GPS to GO. Several telematics companies pursued Harmes after he decided to make the switch for ServiceMaster, a commercial and residential carpet, furniture, and insurable loss cleaning company. He says he chose Geotab because they are a Canadian company and they offered the most seamless and streamlined installation process. After two years, Harmes takes pride in knowing where the company vehicle is at any point throughout the day. “If the vehicle is supposed to be on the job, I’d like to know that it’s on the job,” he says. Harmes explains that this peace of mind that comes with knowing vehicle locations and routes has made customer service and billing simpler as well. The company is able to easily resolve disputes from customers about what time the truck arrived for service or for jobs that were billed by the hour. ServiceMaster of the Valley also utilizes the Geotab technology to monitor driver behavior such as speeding. 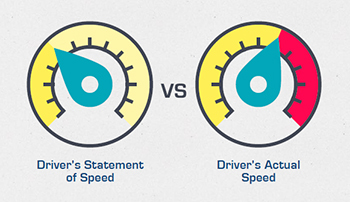 Harmes is able to point out drivers who were driving significantly over the speed limit, even if they claim otherwise. The company doesn’t fully utilize all of Geotab’s features, Harmes explains. But he recognizes the ability to track maintenance and mileage and he is hoping to delve more into those features soon. Mostly though, he appreciates knowing where his trucks are and that if a situation arose where he needed to resolve a major customer issue, the software would be there to help. 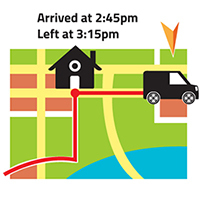 GPS to GO provides the latest Geotab GPS fleet tracking systems throughout North America. Get rolling with our famous $50 GPS trial offer today. We send you the plug and play devices and you test them on your fleet. We credit the amount to your account when you’re ready to purchase. Best of all, there’s no obligation, you can cancel anytime, and there’s never any contract. You have nothing to lose, so get started on securing your vehicles today.